Home » Blog » Want to scare everyone tonight? Why not dress up as a vulture? Want to scare everyone tonight? Why not dress up as a vulture? Do you know that old saying ‘a face only a mother could love’? Our animal discussed today fits that old saying perfectly. This animal is often featured as a symbol of doom and gloom in movies and on Halloween. This unloved creature is the amazing and often misunderstood Turkey Vulture. Turkey Vultures have a fascinating lifestyle with some useful yet strange habits that people view as rather unsavoury. Despite the unlovable parts, they are extremely beneficial to our ecosystem. Many people are surprised to know we have vultures around this area. They soar through the high skies on broad wings looking very much like a raptor and are often mistaken for eagles. However, when a Turkey Vulture is viewed closely they have very distinctive features. Turkey Vultures’ colouring is a blackish-brown, with a very small red and featherless head with an off-white hooked bill. When in flight their wings form a shallow ‘V’ and they appear to wobble side to side as they ride the thermal updrafts. Some would describe vultures as grotesque to look at; yet, they play an important part in sanitation. Their diets consist of carrion (dead animals), which they locate by sight and smell. These vultures are one of the very few birds with an excellent sense of smell. The lack of head feathers keeps them relatively free from bits of their food sticking to them. When threatened they may either play dead or vomit, whereas the horrible smell quickly repels predators. 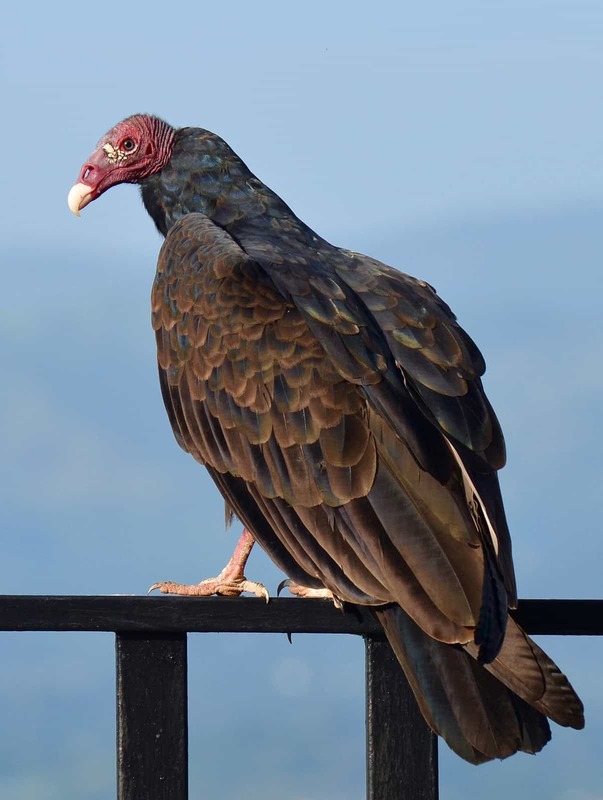 Even Turkey Vultures have standards, as they prefer fresh carrion and have been known to leave the scent glands of a skunk to the side. Turkey Vultures migrate south for the winter so right now and into September is a good time to watch for them. October 31, 2018 | Comments Off on Want to scare everyone tonight? Why not dress up as a vulture?